With Spain and Catalonia at a standoff following an Oct. 1st referendum, pressure is mounting on the separatist government of the autonomous region to either declare or abandon its push for independence. Spain's Prime Minister Mariano Rajoy has given Catalonia's separatist leader five days to say whether or not he has declared independence. If Catalonia confirms it has, the state will be given a further three days to withdraw that declaration. 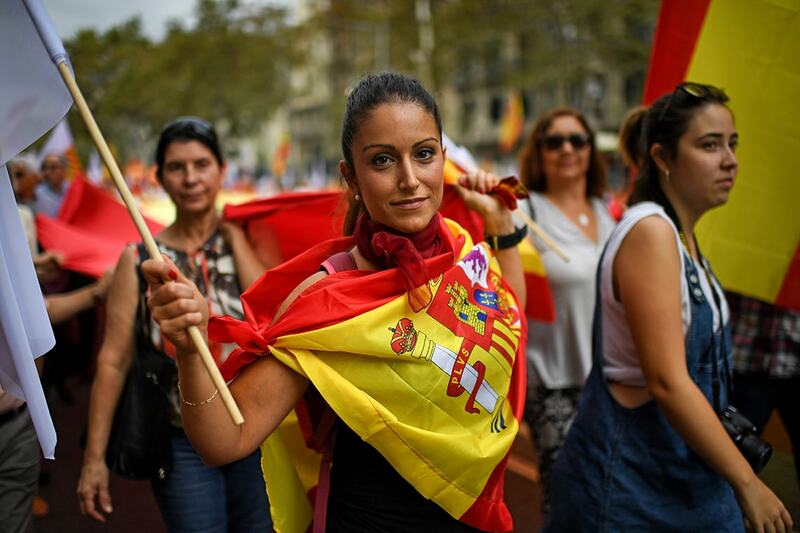 If they keep to their desire for independence, Madrid has warned it will invoke Article 155 of the constitution, allowing it to suspend the region's autonomy and impose direct rule. In response, the Catalan leader has accused the Spanish government of ignoring his calls for negotiation. Earlier in the week, he pulled back from declaring independence by proposing a delay to allow time for dialogue. U of T News spoke with two U of T experts on the region, both of whom are Catalan. Carolina de Miguel Moyer, assistant professor of political science at U of T's Faculty of Arts & Science, says people are worried about the conflict escalating. “The worry is that polarization among the public and the parties is leaving very little room for a negotiated solution,” she says. Dr. Carles Muntaner, a medical doctor and a professor at U of T's Dalla Lana School of Public Health, has been advising the Catalonian government on health issues. On secession, he says the Catalan government should declare and implement independence immediately. “The Spanish state does not understand negotiation, only force,” he says. Catalonia has been talking of separation and independence for years. What triggered the referendum and brought this issue to the surface this time around? Carolina de Miguel Moyer: Support for independence in Catalonia has gone from 20 to 25 per cent in the 1980s and 1990s to the current 40 to 50 per cent. Two factors can help explain this increase: First, in 2010 the Spanish Supreme Court struck down several articles of a reformed Catalan statute of autonomy that had been approved by the Catalan and Spanish parliaments in 2006. These articles established more devolved fiscal powers to Catalonia as well as the symbolic recognition of Catalonia as a nation and the use of Catalan as the main administrative language. This created the perception that Catalonia’s demands were not being respected, which fuelled an already-existing sense of regional grievance. Secondly, the financial crisis and the austerity measures that followed created substantial discontent among the population. Some Catalan parties, capitalizing on that discontent, criticized the central government for forcing to make cuts at the regional level, and they revived the idea that Catalonia was already paying too much into Spanish coffers. These events contributed to a rise in electoral support for pro-independence parties, which led to a pro-independence majority government in the 2015 Catalan regional elections. This government viewed itself as having a mandate to pursue independence, and the means it chose to pursue independence was the Oct. 1st referendum. Carles Muntaner: A new but modest autonomy statute was approved in 2005 by 88 per cent of the Catalan parliament and passed a Catalan referendum in 2006. But the Spanish government of socialists and the right, and then the Supreme Court, controlled by the right, stripped it from most of its usefulness in 2010. That triggered the end of hopes that there could be a new arrangement within Spain. What would imposing Article 155 do to the situation? Carolina de Miguel Moyer: Article 155 of the Spanish constitution gives the Spanish government powers to suspend Catalan autonomy if Catalonia “breaches the obligations that the constitution and other laws prescribe, or acts in a way that compromises Spain’s general interest.” The Spanish Prime Minister Mariano Rajoy has been hinting for weeks about using Article 155 as a response to a potential declaration of independence from the Catalan government. It does not contain specific measures to ensure compliance, so it remains to be seen what the Spanish government will do. However, given the defiance of the Catalan government up until now, using Article 155 to suspend Catalan autonomy would probably require political force. It is hard to predict where this would lead, but it has the potential to further escalate the current conflict, making any negotiation very difficult. The use of force has the potential to increase support for independence within Catalonia. Carles Muntaner: Yes, he will use it to effectively end Catalan autonomy. He started already, days before the referendum, with detentions of civil servants, reductions in basic rights, closing websites and police repression. Spain's prime minister said this week that Catalan's leader needs to clarify whether or not it has declared independence. Didn't the vote do that? Carles Muntaner: Yes, Catalan [regional] leader Carles Puigdemont declared independence, but under pressure from the EU suspended its implementation for a few weeks to find a dialogue with Spain. Carolina de Miguel Moyer: No, because the legality of the referendum is contested and because the Catalan government’s statement on independence on Tuesday was very ambiguous. The government parties in the Catalan parliament passed a law before the referendum that stated that the parliament would declare independence within 48 hours if the referendum resulted in a majority of pro-independence votes. The referendum yielded 90 per cent in favour of independence with only 43 per cent turnout and few procedural guarantees. Tuesday evening, the Catalan leader, Carles Puigdemont, addressed the Catalan parliament and declared that based on the results of the Oct. 1st referendum, Catalonia had earned the right to statehood and that he had a “mandate to transform Catalonia into an independent state in the form of a republic.” He then added he would ask the Catalan parliament to “suspend the effects of the declaration of independence” for a few weeks in order to seek a negotiated solution. After this address, he stepped out of the parliament and signed a declaration with his coalition partners that established the creation of the Catalan republic as an independent sovereign state. The Catalan leader’s deliberate ambivalence regarding independence is seen as an attempt to appease the hardline separatists in his governing coalition while at the same time responding to the growing political and economic pressure developing in opposition to a unilateral declaration of independence and to seek a negotiated solution. With the ball in his court, the Spanish PM has asked the Catalan leader to clarify whether he has declared independence. This request has been interpreted as a first step in the application of Article 155. What is the mood in Spain right now, both in Catalonia and the rest of Spain? Carles Muntaner: It depends on ideology. There has been a surge of nationalism in Spain with anger at Catalonia, including the first joint demonstration of 14 far right groups. Similarly, many Spaniards have adopted an open National and National Catholic stances, like in the Franco era. There have also been demonstrations in many Spanish cities in support of Catalonia's right to decide its future. In Catalonia, the mood is a mixture of hope and fear, and uncertainty about more violence from the Spanish state. Let's remember the police actions of Oct. 1. The police are still there roaming the streets in defiance. There is also the fear of losing the autonomous self-rule but determination among a majority of independentists and sovereigns to stand up to Spanish aggression. They will not bow out easily, in particular the people of Catalonia and the independentist parties. Carolina de Miguel Moyer: ​People are worried about the conflict escalating to a point of no return. The worry is that polarization among the public and the parties is leaving very little room for a negotiated solution. The economic impact is also visible, with key businesses relocating their headquarters outside of Catalonia in the past couple of days. If Catalan declares independence would the EU accept its independence? Carles Muntaner: Not initially maybe, but eventually. The EU is pragmatic, and the Catalan government has never wanted to leave it. Carolina de Miguel Moyer: It depends on whether the Catalan declaration of independence is in accordance with the Spanish constitution. If Catalonia declares independence and the Spanish state does not recognize it, then the EU will also not recognize Catalonia as independent. After all, the EU does not want to encourage other separatist movements across Europe. However, if Catalonia were to declare independence in accordance with the Spanish constitution, which seems highly unlikely and probably impossible, then the EU will surely accept the independence of Catalonia. The EU has also made clear, however, that an independent Catalonia would automatically be outside of the European Union and would have to reapply for membership in the block. This process of reapplying to EU membership is unlikely to go smoothly given the veto power that member states have in secession negotiations. In sum, the EU is treating the Catalan question as a domestic problem for Spain that needs to be resolved within the Spanish constitutional framework. It has thus refused to intervene in the conflict despite calls for mediation from the Catalan government, although it has condemned the violence that occurred during the Oct. 1st referendum. As an adviser to the Catalan parliament, have you given any advice on this situation? What would you advise? Carles Muntaner: I only give my opinions on health policy, but I would advise them to declare and implement independence right away. The Spanish state does not understand negotiation, only force. It's a state that has lost all its colonies but Catalonia. Their view of the state is totalitarian like in the Franco era, nothing changed in this arena. After Cambodia, Spain is the country with the most unearthed victims of the government (about 120,000), and Francoism killed many more of its citizens than say, Mussolini's fascism. The current government has one degree of historical separation from that regime. The only way out is the very hard Gandhian way – no violence, no co-operation and a proclamation of independence – in my humble opinion.